Our 24,000 square-foot cultural museum features two gallery spaces with special art exhibits, “The Dream of America” exhibit, the Brunk Children’s Museum of Immigration, a genealogy center and our Museum Store. All areas are wheelchair accessible. Contact the Museum at 773.728.8111 to reserve a guided tour for your group or click here for more information about tours, parking and our hours of operation. Through its arts and educational programs and its permanent collection, the Swedish American Museum interprets the immigrant experience for children and adults and promotes an appreciation of contemporary Swedish-American culture. 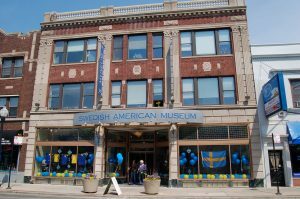 To be the preeminent Swedish-American immigration museum in the greater Chicago area and a unifying force within the Midwestern Scandinavian community.